Pho? Banh mi? What else? From smokey grilled meats by the street to a pizza joint we failed to get reservations for thrice (and how about eggs in your beer? 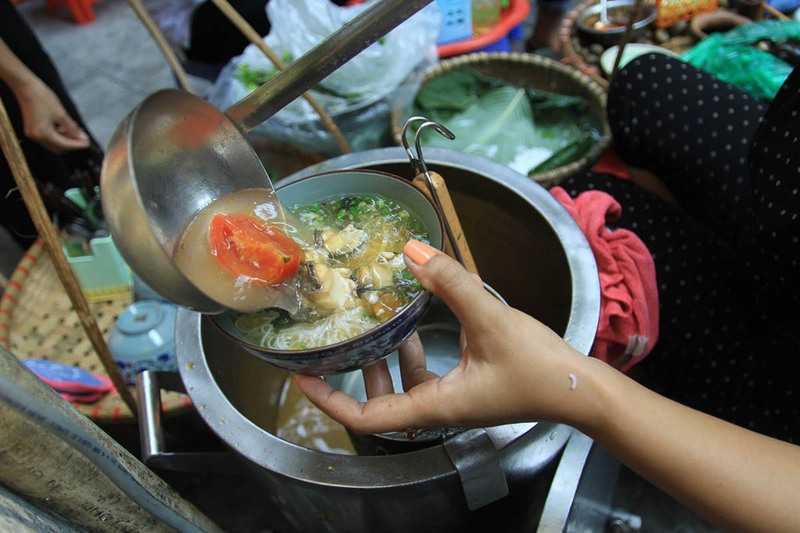 ), this is the only Hanoi food guide you need. I’m fully convinced that Hanoi is a food paradise. 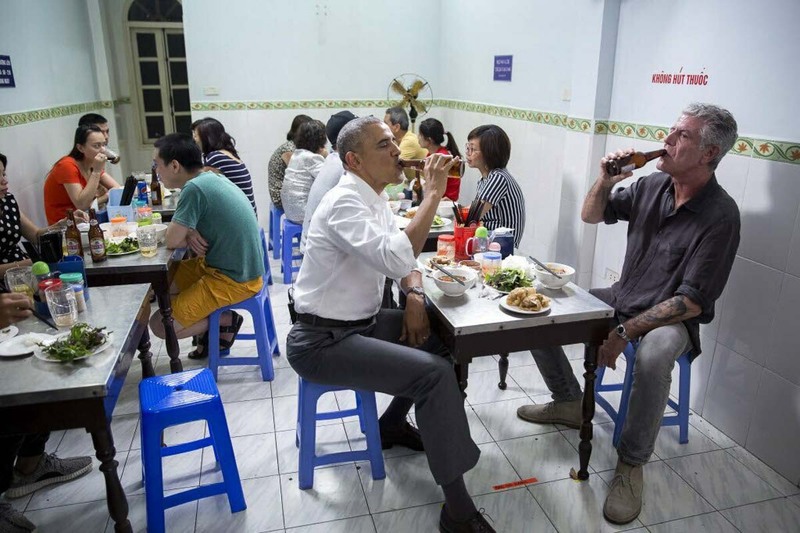 For starters, Hanoi was the place where Barack Obama and the late Anthony Bourdain enjoyed a meal at a bun cha store back in 2016. How many other cities can claim that title? Amidst the chaos of motorbikes and mad traffic, the city is a treasure trove of narrow streets filled with delicious food and drinks. 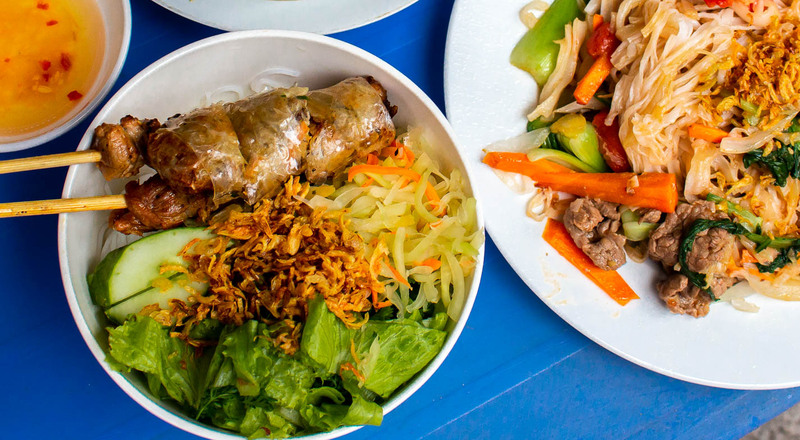 There are just so many places to eat in Hanoi! 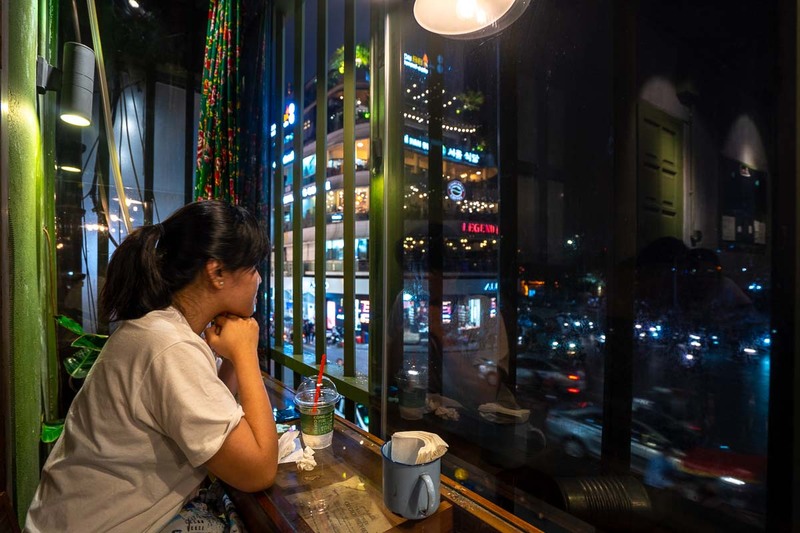 You might find yourself scoffing down noodles on plastic stools by the roadside, then chilling in a café with a damn good cup of Vietnamese coffee. 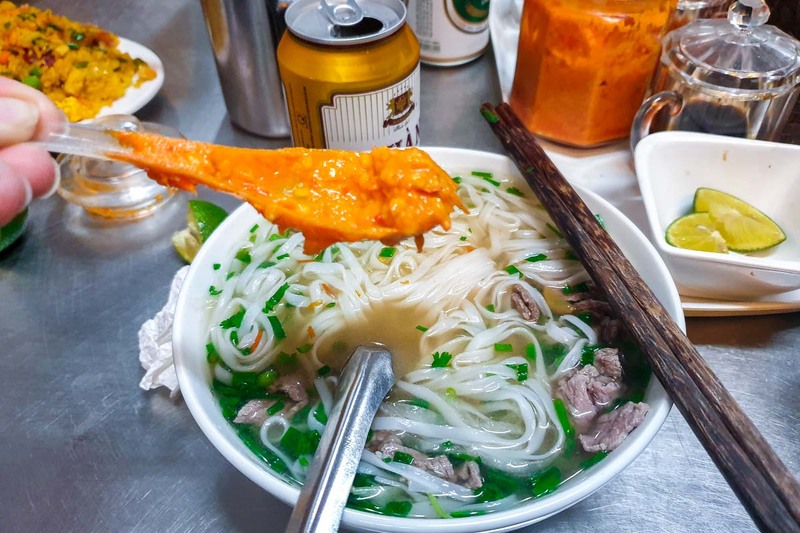 This Hanoi food guide brings you on an un-pho-gettable journey through 31 of the city’s must-try places to eat. 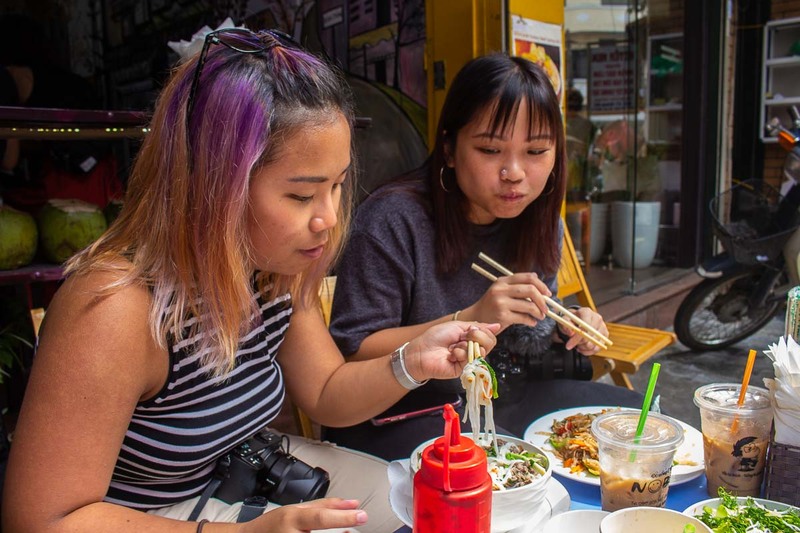 Well-known Vietnamese fare like pho, banh mi, and egg coffee are included in this list too, but you can always skip them like thank u, next. There’re still 28 other places waiting for you. 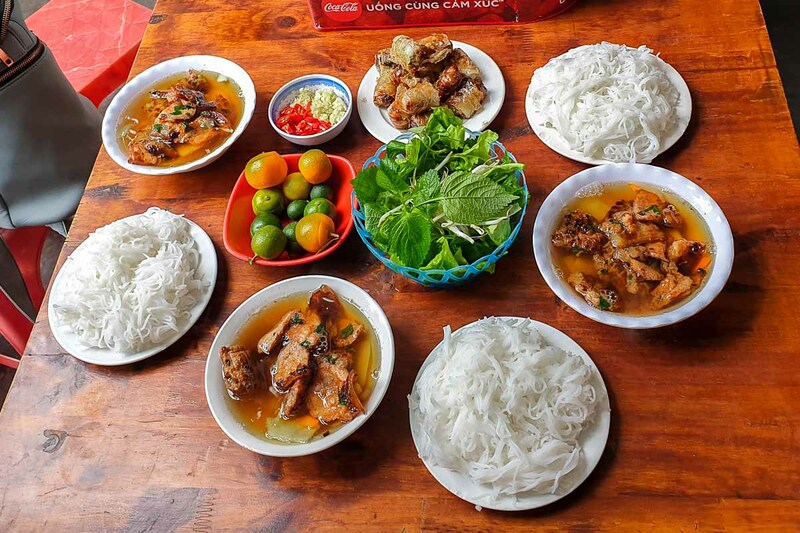 Eating by the roadside is the quintessential Vietnamese dining experience. 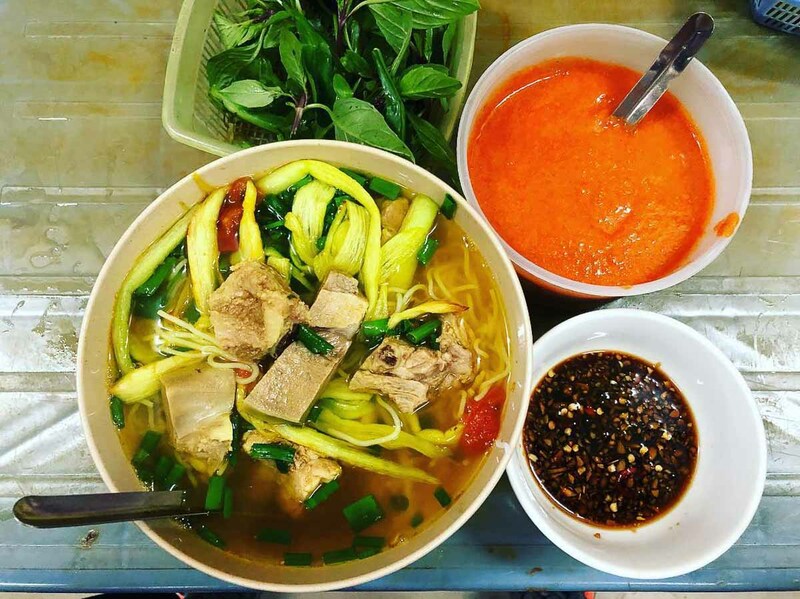 Wanna eat your way around Vietnam? Check out our 2-week Vietnam itinerary! 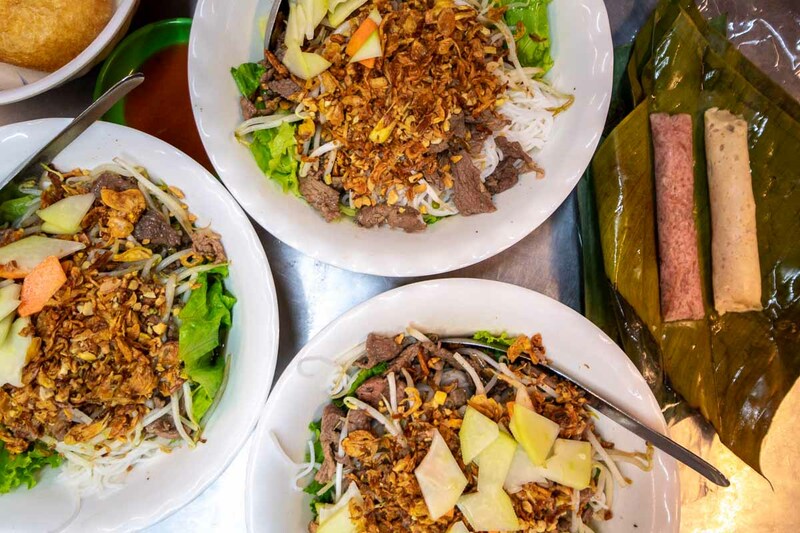 Bun Bo Nam Bo Bach Phuong is like a household name, serving what some say is the best street food in Hanoi. Its signature dish bun bo nam bo (beef noodle salad) is a delectable medley of springy noodles, fresh veggies, and tender beef slices. If you’re extra hungry, add a nem chua (sour meatball) or gio (pork roll). Both cost 6,000₫ (~S$0.35). The eatery sees a steady stream of locals and foreigners. Go earlier or after regular mealtimes to avoid the crowd! I know, it’s pho — but hear me out! We stumbled upon Spicy Pho Bay, a hidden gem that was so pho-king good (hehe) we went back twice. The pho (30,000₫, ~S$1.80) is simple and delicious, with a huge portion of noodles and beef slices. Add a dollop of outrageously spicy, Hainanese chicken rice-esque chilli into the broth to kick it up a notch! Excuse the mess. We couldn’t wait to dig in. The star of Spicy Pho Bay, though, is the unassuming mixed fried rice (com rang thap cam, 30,000₫). 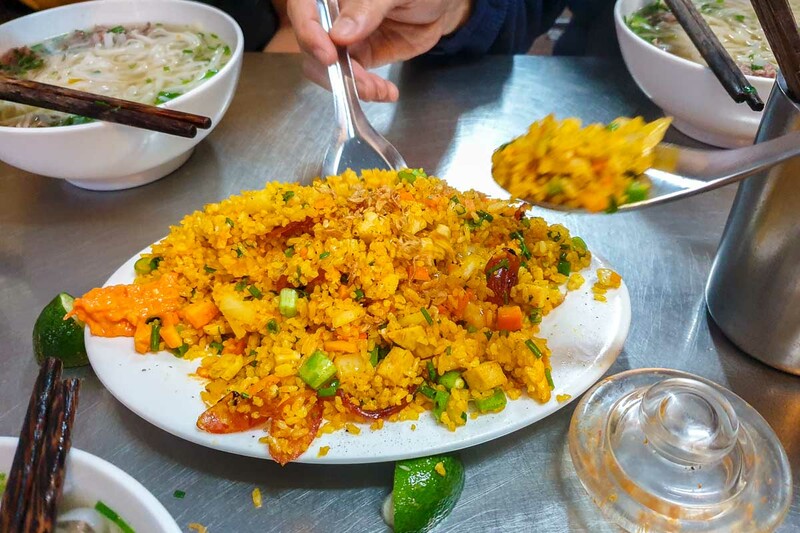 Butter-fried rice is piled high on a plate with Chinese sausages, tofu and spring onions. It’s incredibly fragrant, and perfect for sharing. Note: This eatery is located outside Hanoi Old Quarter, where most street food is located. If you’re looking for a nearby alternative, try Pho Gia Truyen. You may have had pho in soup form, but have you ever had it deep fried? For a textural change, head to Pho Cuon Vinh Phong and order pho chien phong (50,000₫, ~S$2.90). Thick rice noodles are deep fried to a crisp, and finished with a heap of stir-fried vegetables and beef slices. Healthy-ish! Mi Ga Tan 24 is a great street stall for comfort food, especially if you’re feeling sick — because they serve up a mean herbal broth with tender chicken and instant noodles, called my ga tan. You can also add chicken innards like brain and liver. The dish is hugely popular among locals all-year round! Also order a glass of cold Kumquat juice (10,000₫) to go with your meal. It’s not too sweet, and very refreshing. It’s not exactly unagi, but it’s just as delicious. Mien Luon Dong Thinh specialises in fried and grilled eels. It’s an interesting alternative to the usual proteins, and worth checking out if you enjoy the aromatic, fishy taste of eel. There are both dry and soup noodle versions available, and even porridge too! 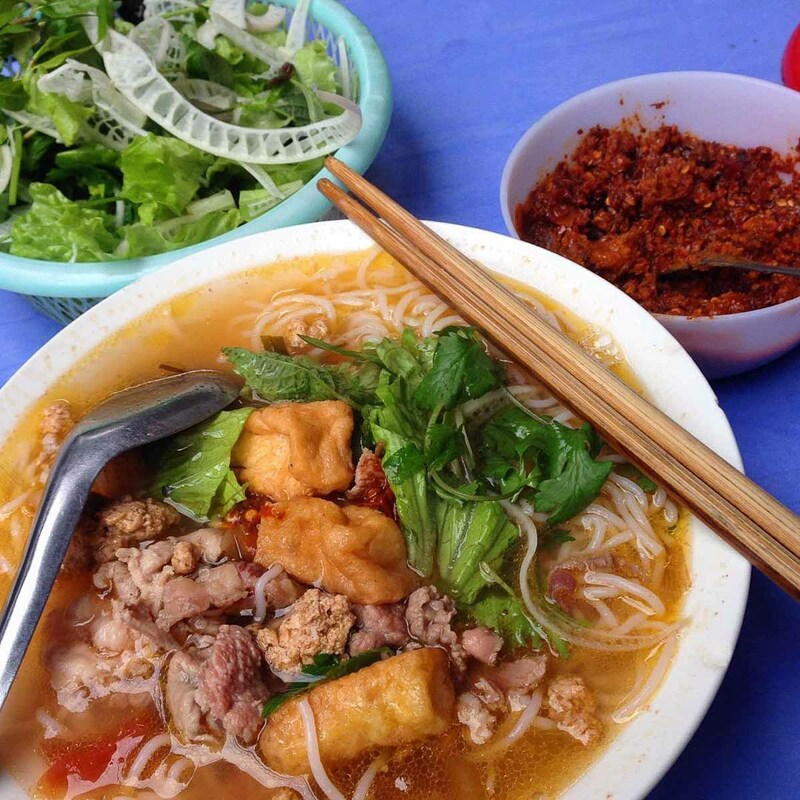 Bun rieu is another highly popular noodle dish in Vietnam. This version has freshwater crab, pork, tofu, and vermicelli noodles swimming in a tangy tomato broth. Bún Riêu Cua Hàng Bạc is apparently one of the best stores in Hanoi. The evidence? Hordes of locals crowding here every morning for a hot bun rieu breakfast. A Hanoian original, you cannot leave the city without having bun cha. One, it’s the dish Barack Obama and Anthony Bourdain shared. 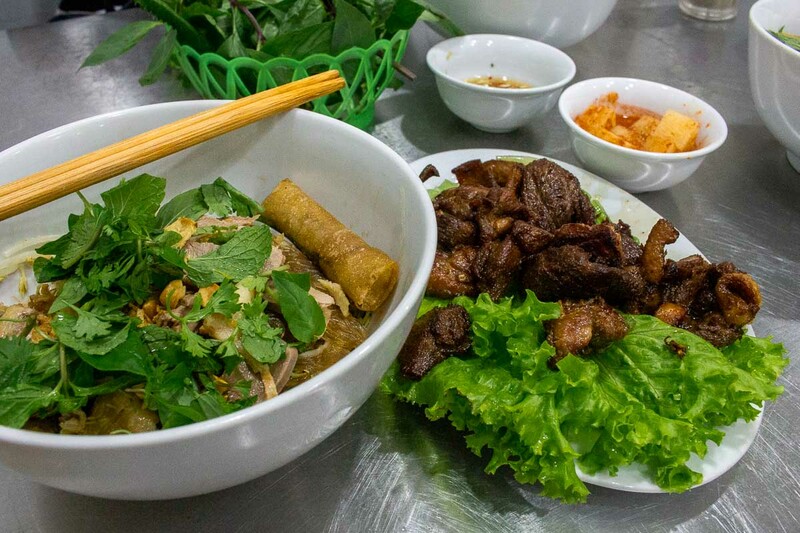 Two, it’s a combination of grilled pork in a cold broth, rice noodles (bun) and fresh herbs. Three, it’s delicious — I’d be sad if you missed it. We were disappointed to find that Bun Cha Huong Lien, where Obama and Anthony ate at, was closed for renovation (until 22 March). Thankfully, we managed to get our bun cha fix at Friends Bar and Bun Cha outside of the Old Quarter. Cheap and tasty, we highly recommend it if you’re in the area! Note: Alternatively, try Bun Cha Ta in Hanoi Old Quarter. Vegetarian options are also available. Duck noodles with a tastier twist! 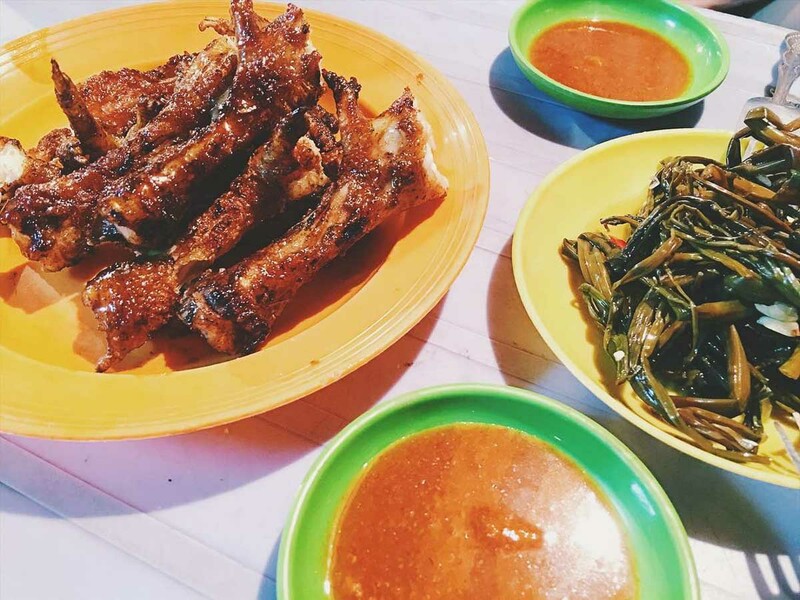 Hanh Ngan De uses muscovy duck, a large duck with leaner and more tender meat. We recommend having boiled duck with savoury glass noodles (mien tron, 45,000₫). Bigger eaters can go for bun mien ngan (50,000₫, ~S$2.90), soupy rice noodles which come with a chunk of coagulated duck blood. 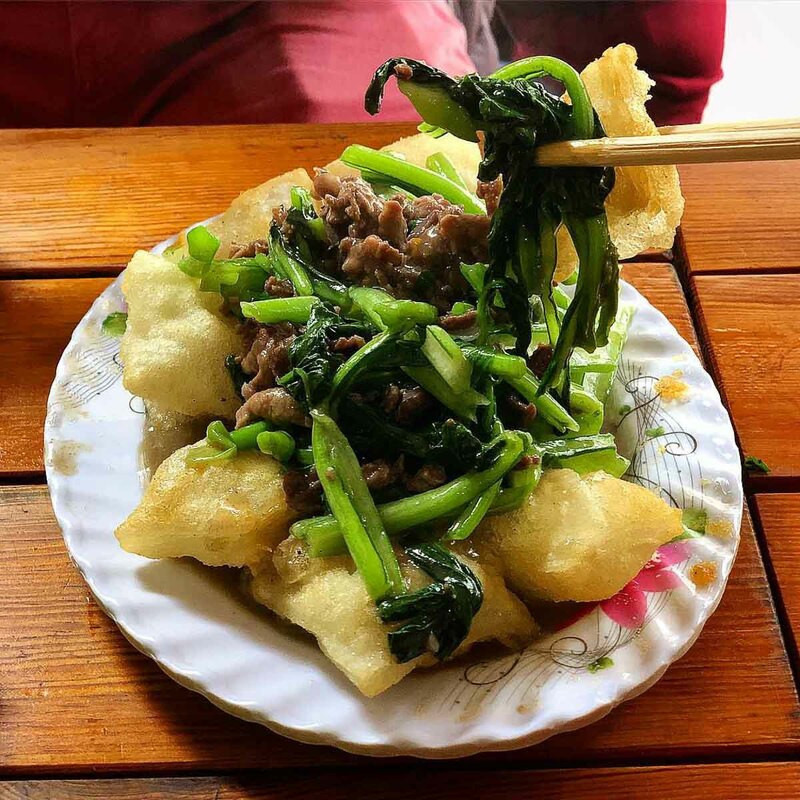 Carnivores can also order boiled (ngan luoc) or grilled duck (ngan nuong) on its own — a one-quarter portion costs 80,000₫ (~S$4.70). Note: Google Maps lists this place as permanently closed, but it’s still operating when we visited (twice) in February 2019. Notoriously (or famously?) 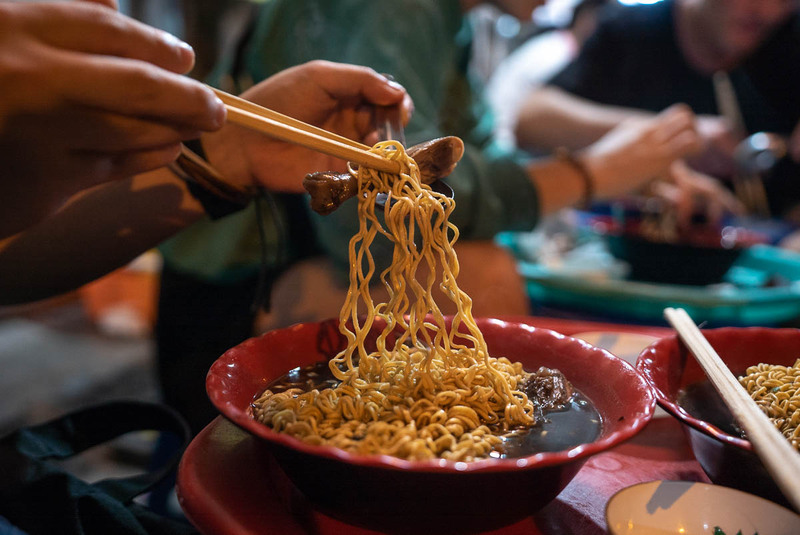 known as “cussing noodles”, Bun Chui was brought into the culinary spotlight after Anthony Bourdain ate there in Parts Unknown. There’s only one dish available: bun doc mung (pork noodle soup). The dish includes pig parts like knuckle and snout, which adds a richer flavour to the noodles and tomato broth. In case you’re wondering, “cussing noodles” came about because of the head chef. The mean reputation derives from her supposedly yelling and insulting everyone who frequents the store. Luckily, that’s not (always) the case! PSA seafood lovers: don’t miss cha ca, grilled fish with turmeric and dill that originated from Hanoi. Cha Ca Thang Long is a highly recommended restaurant that serves this local delight, and they don’t disappoint. 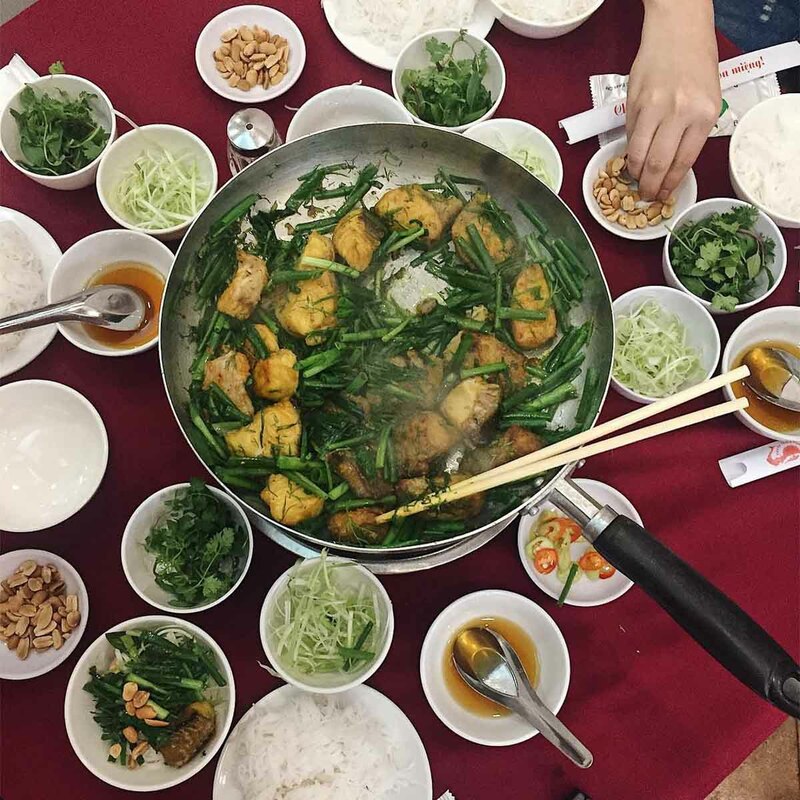 Fresh, tender fish is served alongside vermicelli, fresh herbs, peanuts, and a special in-house dressing. Simply put, bun oc is snail noodle soup. As strange as it may sound, it’s actually quite light and delicious. (Btw, the snails are from rice paddies, not streets!) Don’t expect anything fancy though. You’ll be sitting on plastic stools by the street slurping these suckers down — just like Anthony Bourdain did. Xoi is a glutinous rice dish that comes with toppings of your choice, such as braised pork and omelettes. It’s traditionally consumed for breakfast, but we’re not going to tell you how to live your life. Xoi Yen is a great place to enjoy the dish. The shop operates from super early in the morning to late at night too, perfect for late-night munchies. 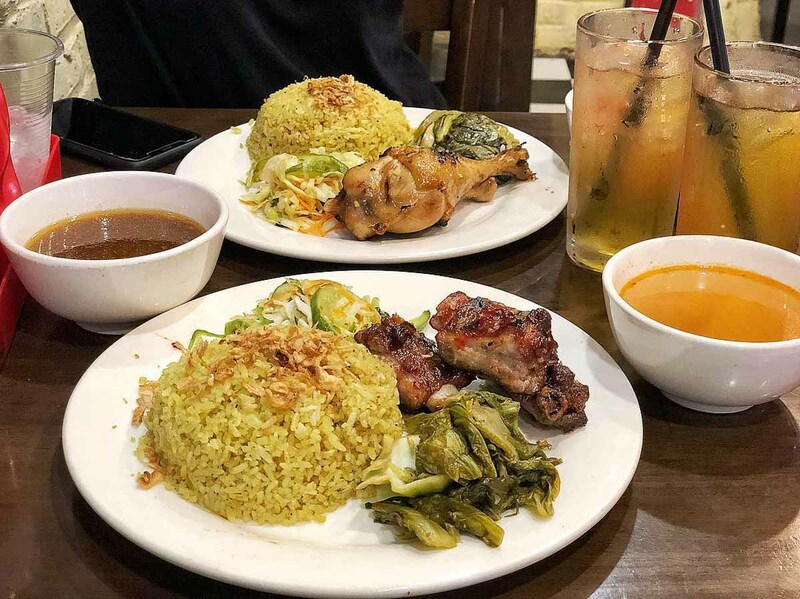 For a filling “fast food” meal, Com Suon Dao Duy Tu serves rice with succulent grilled meats. We had the recommended com dao suon nuong (grilled pork ribs with fried rice, 50,000₫, ~S$2.90), and were pleasantly surprised. The grilled ribs were so tender that the meat easily came off the bone. A comforting bowl of porridge with spare ribs (chao suon) can never go wrong. Only, this version is much thicker and creamier. Rice flour is added to the mixture to create a consistency that parallels congee. Either way, it still tastes great. 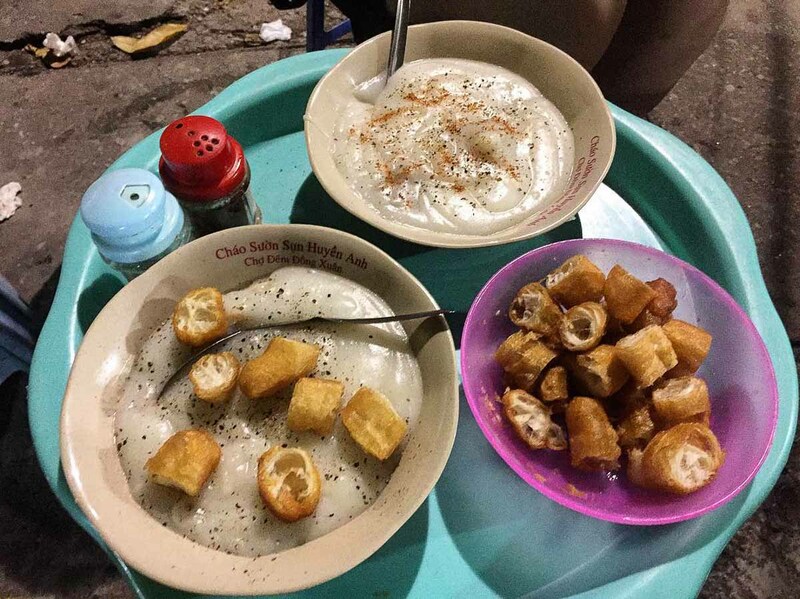 At Cháo Sườn Sụn Huyền Anh, porridge is served with pork floss and youtiao (fried dough fritters). If you’re a carb lover, the cheap and tasty sandwiches from Banh Mi 25 are a must-have. The baguettes are warm and delightfully soft with a crispy crust. There’s a plethora of fillings to choose from, but we went with the bestselling sauteed beef with cheese (35,000₫, ~S$2.05). Opening Hours: 7AM – 9PM. Closes 7PM on Sundays. 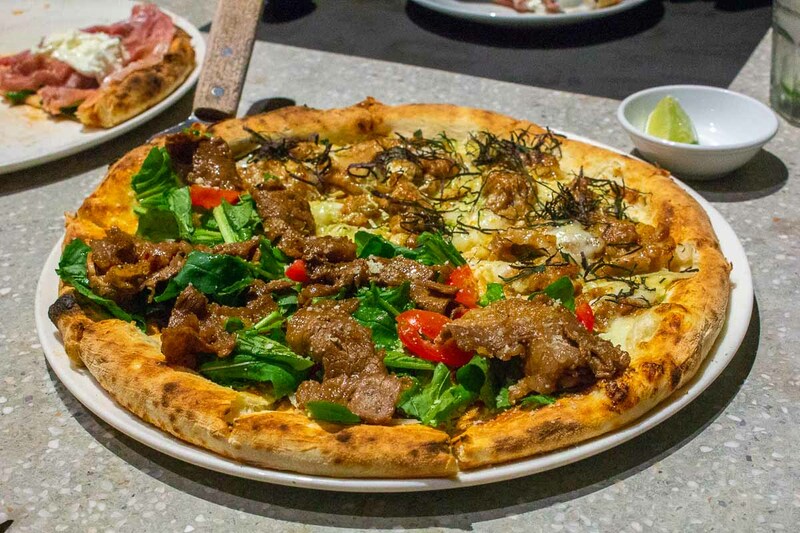 A half-and-half pizza of soy garlic beef and Japanese ginger pork. We failed to score a reservation here three times. That’s how popular Pizza 4P’s is! While it’s pricey, the excellent pizzas are worth ballin’ for one night. You can even get half-and-half pizzas for greater variety. Don’t miss out on the five-cheese pizza (280,000₫, ~S$16.40). It’s calorific for sure, but oh-so creamy and satisfying. You’ll need to make a reservation online or over the phone. Or, you can do what we did and go really early for walk-in seating (we went at 5:30PM for early dinner). 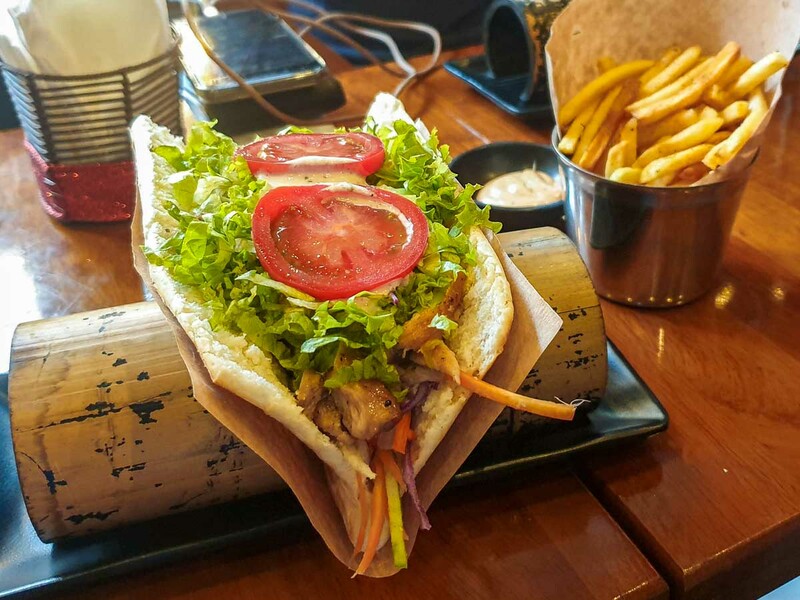 If you’re ever craving Turkish food, Kebab & Co. dishes out some wickedly good kebabs. We loved how the breads were grilled to a crisp, and filled with tender meats and tangy, spicy sauces. Every bite was flavourful with a satisfying crunch. Portions are big, so come hungry! 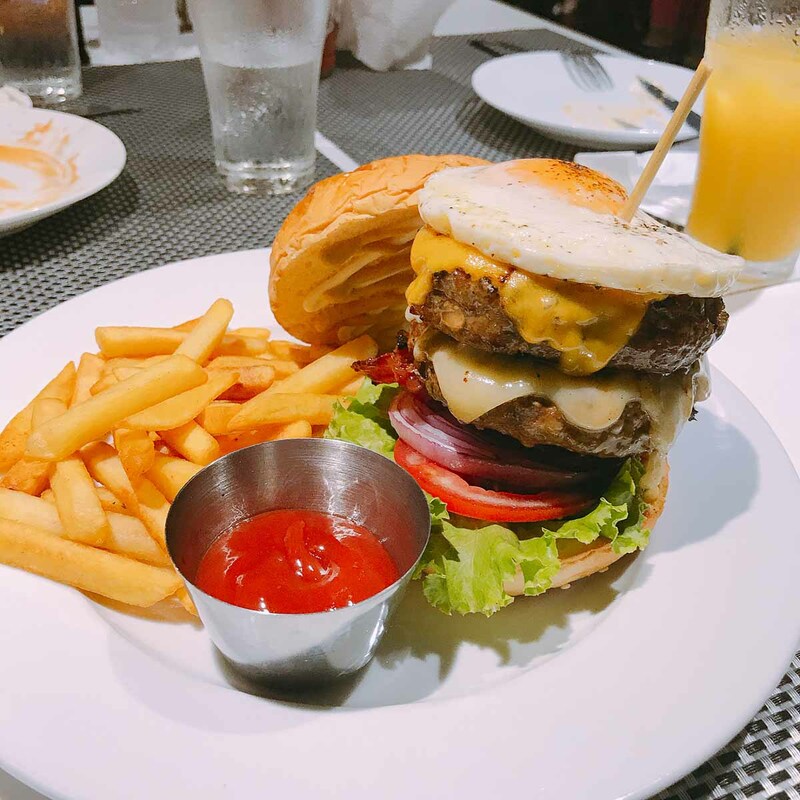 The only American diner in Hanoi is legit. From the red booths to neon signs, the decor of S&L’s Diner makes you feel like you’ve stepped into the US (but would Trump approve?). The real show-stopper here is the authentic American comfort food though. Expect hearty meals like burgers, steaks, and all-day breakfasts. 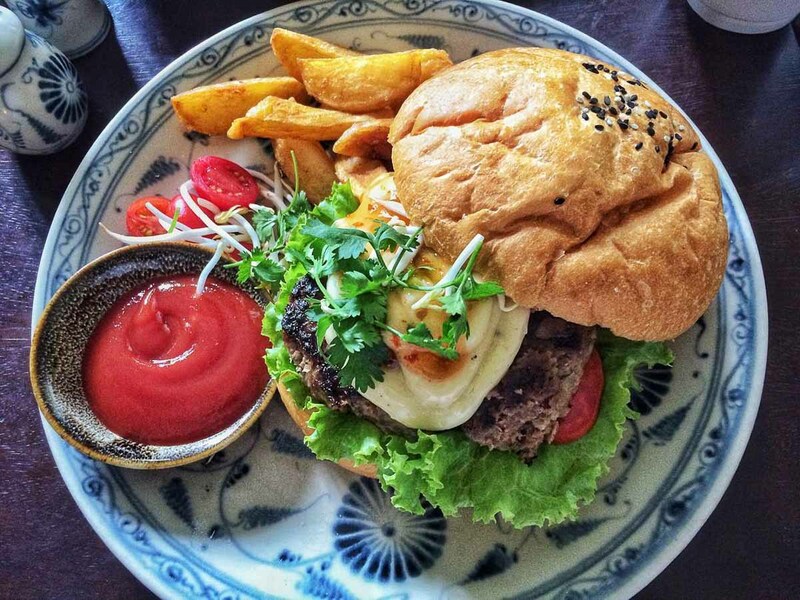 Far from networking, the Hanoi Social Club is a laidback, hipster cafe located in a picturesque French colonial villa. You won’t find any Vietnamese fare here. The cafe’s specialties are vegetarian and vegan “soul food” like veggie burgers (130,000₫, ~S$7.60) and quinoa salad (120,000₫, ~S$7). They also host regular live music events. Opening Hours: 8AM – 11PM. Closes 12AM on Tuesdays. 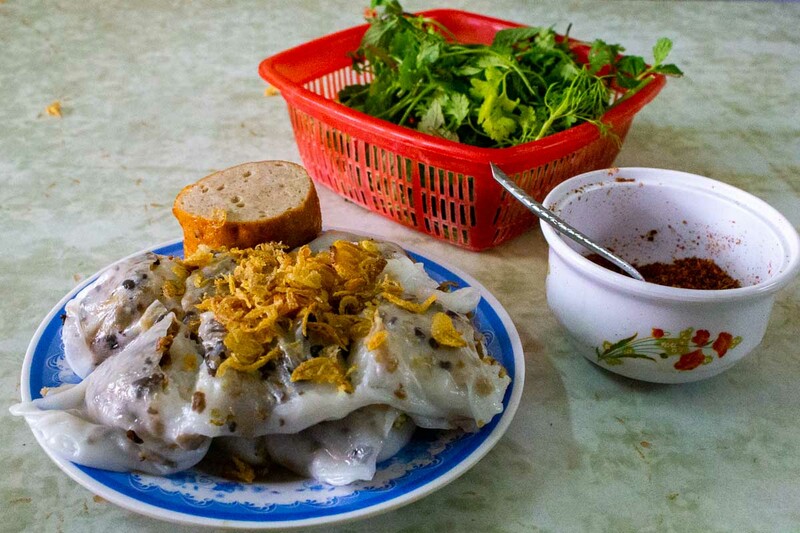 Stuffed with minced meat and finely chopped mushrooms, banh cuon (steamed rice rolls) make a great breakfast or snack. 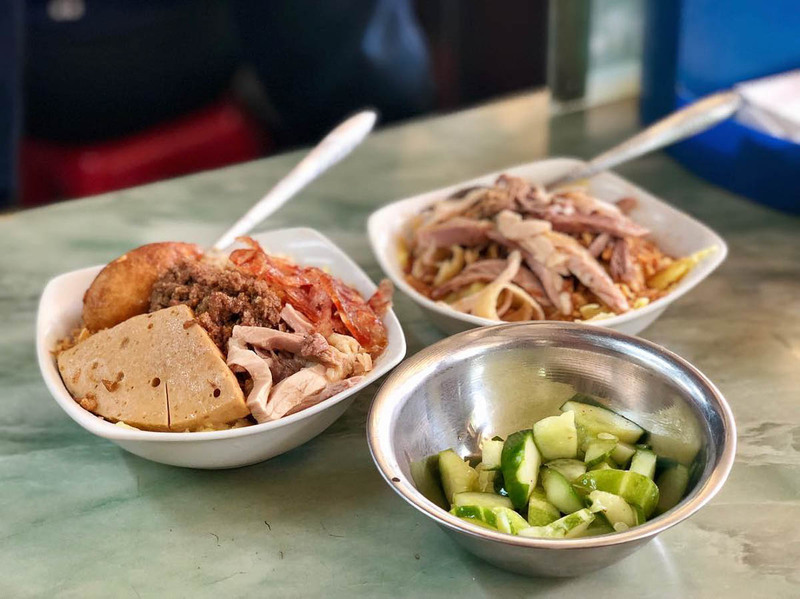 At Banh Cuon Nong Ho Tay, a sweet old lady has been making this dish for years, so you can expect authentic, good quality eats. She also taught us how to eat the rice rolls — add chili, lime and parsley to fish sauce, dip the roll in, and enjoy! Note: This eatery is located outside Hanoi Old Quarter. 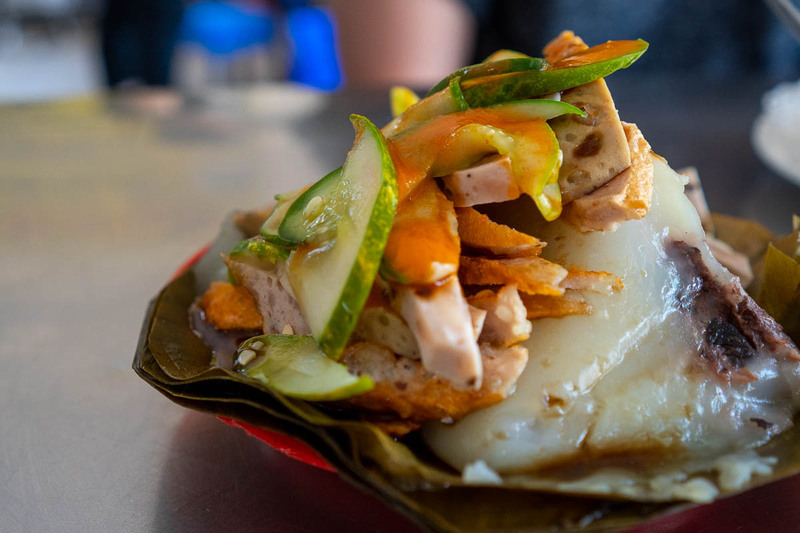 If you’re looking for an alternative, try Banh Cuon Kim Thoa, where Anthony Bourdain ate at! Soft and chewy, the banh gio (steamed rice dumplings) from Banh Gio Miss Beo have a consistency that resembles chwee kueh. We ordered their banh gio day du (27,000₫, ~S$1.60), which came stuffed with minced meat, and topped with picked cucumbers and sausages. 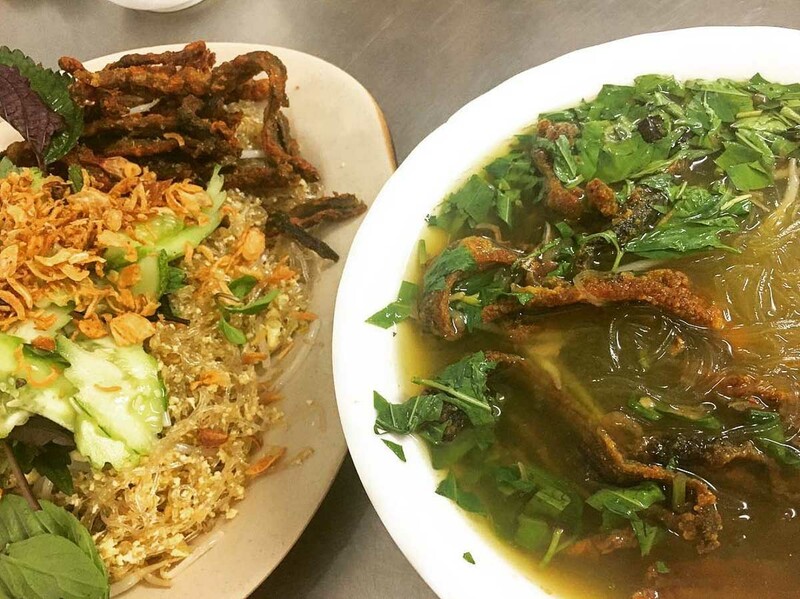 To eat like the how the locals do, sprinkle (or douse) fish sauce and chilli all over to elevate the flavour! Banh trang tron is a mixed salad with rice paper, dried squid, beef jerky, quail eggs, peanuts, and more. It’s an odd concoction that’s sweet, salty, spicy, chewy, and crunchy — which is great if you’re looking for an explosion of tastes and textures packed in one small box. 86 Hang Trong also sells the wrapped up version of the salad (banh trang cuon) for easier eating. If you’re all about that #BBQchickenlife, you’ll be pleased to know there’s an entire street in Hanoi dedicated to this marvellous street food. 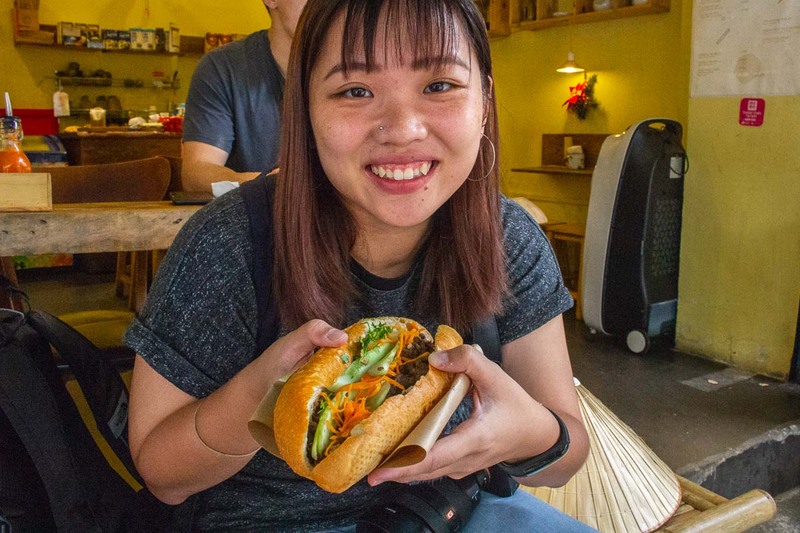 Ly Van Phuc is known as “chicken street“, with vendors selling BBQ’d chicken glazed with honey, alongside sweet potatoes, and banh mi. While it’s quite an adventurous experience, the food along this street tends to be on the pricier side. Chicken thighs cost about 60,000₫ (~S$3.50) each, while chicken wings are 20,000₫ (~S$1.20) each. 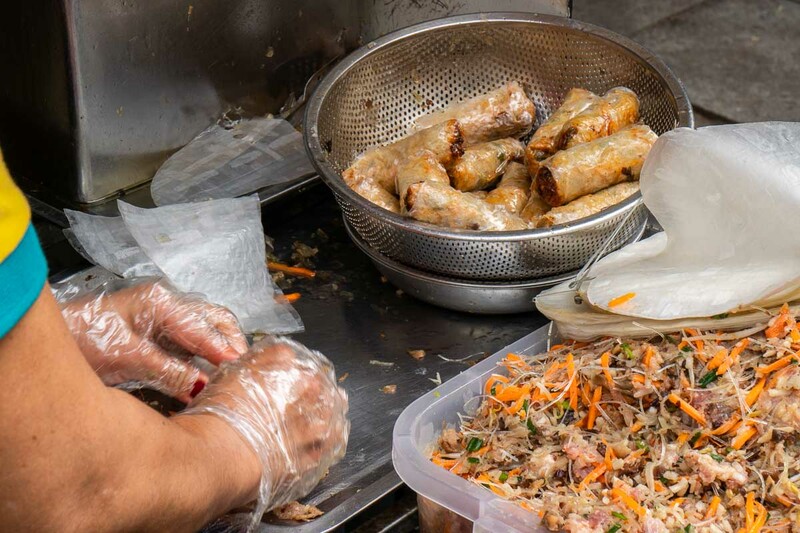 Nem ran (fried spring roll) is like the sinfully divine cousin of the fresh spring roll (goi cuon). 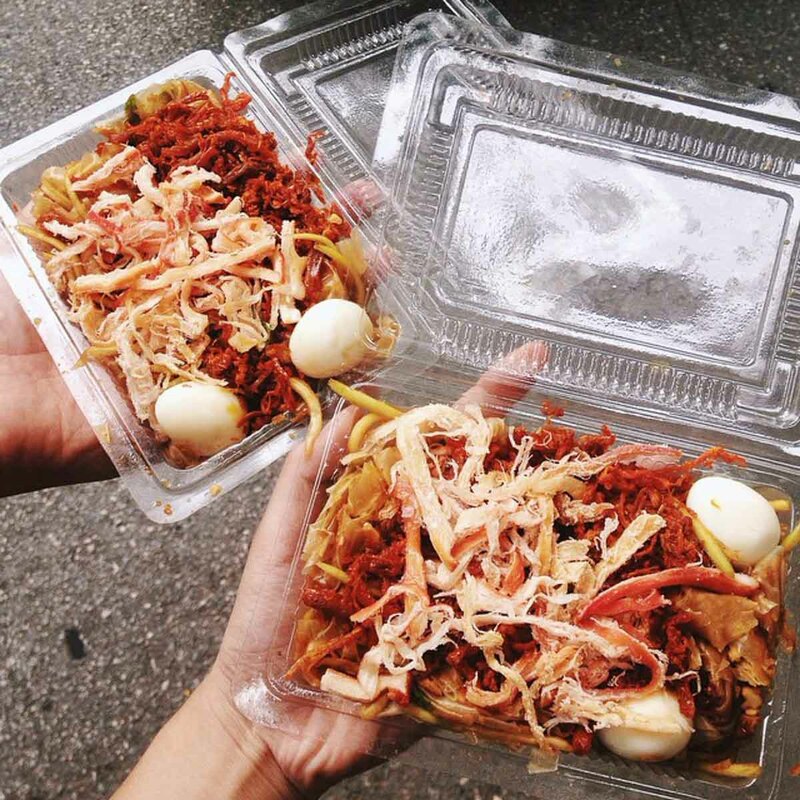 Depending on the vendor, they can be filled with anything from vegetables to minced pork to crab meat. Nem ran is available all around Hanoi. The one we got was from a really small roadside vendor without a proper address. Still, it was a treat watching the lady make them fresh before our eyes — from rolling the ingredients to removing them from the deep-fryer. 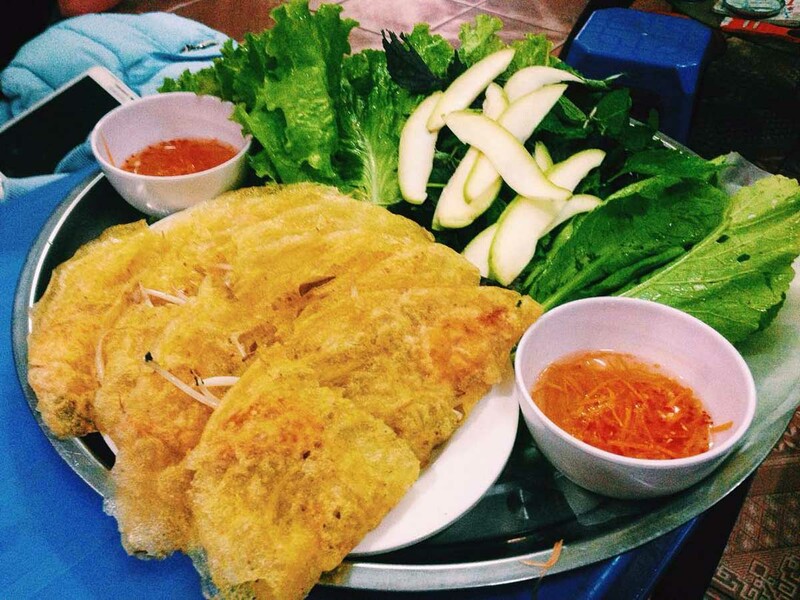 Made of rice flour, banh xeo is like a turmeric-dusted pancake with savoury fillings like chicken, beef or shrimp. Banh Xeo Sau Phuoc is said to sell the best banh xeo in Hanoi, with the owner searing them to a crispy perfection in a small pan. If you’re feeling rather peckish, have nem lui (skewered pork) too! Each stick costs 6,000₫ (~S$0.35). Opening Hours: 11AM – 8:30PM. Closed on Sundays. Highly popular with locals, Che 4 Mua is famous for selling traditional Vietnamese desserts for generations. Service isn’t the friendliest, and there’s no English menu available (here’s a rough dessert list, though). Regardless, the cheap and indulgent desserts are worth the visit. 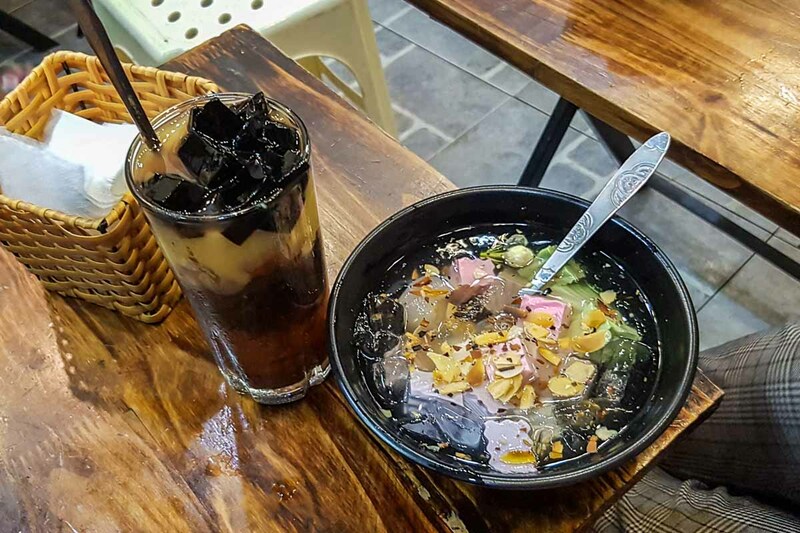 Popular favourites include che khuc bach (milk jellies in sweet soup), and banh troi nong (glutinous rice balls stuffed with mung bean and black sesame paste). *Pro-tip: Look online for photos of a dessert you want to try. The staff may not speak any English, so showing pictures when ordering would be helpful. Kem Trang Tien has been serving ice cream for more than 60 years. 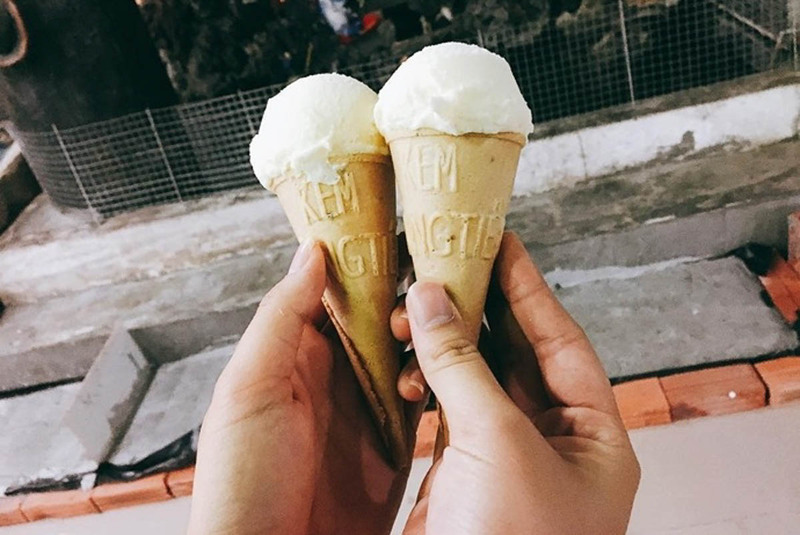 Its signature is a simple vanilla ice cream served in a cone (12,000₫, ~S$0.70). However, there are other types of ice cream available to suit your fancy. These include mochi, popsicles, and soft serve. There’s nothing like beating the Hanoian heat with the cool and sweet desserts from Minci Che Xoai. The only issue is that there isn’t an English menu, but you can always be adventurous and order whatever sounds good. 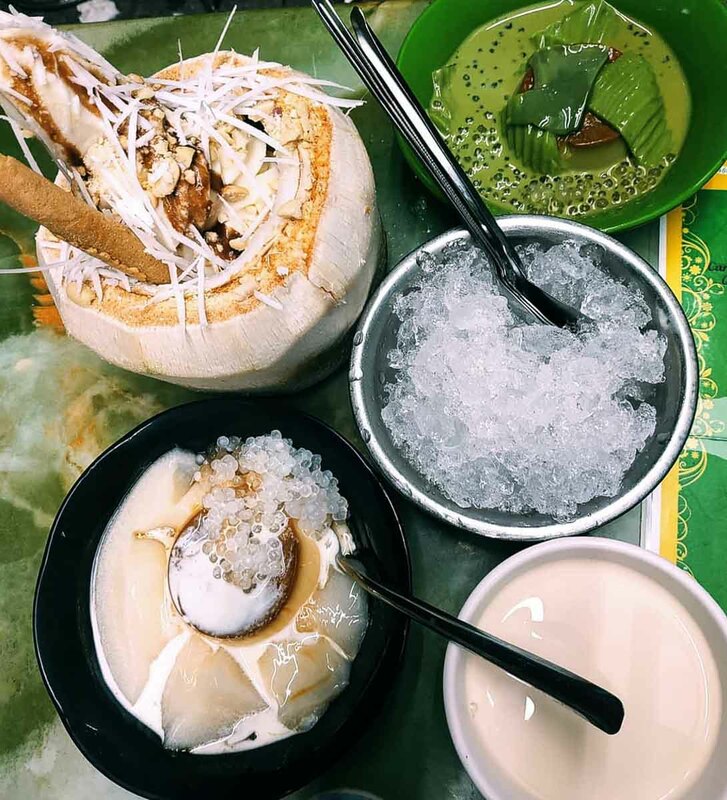 The stall’s bestsellers include Matcha caramel flan (caramen tra xanh thach), mango pudding with sago (che xoai tran chau), and coconut ice cream (kem trai dua). 24-hour dessert joints are a godsend. Hoa Beo is another popular dessert stall that serves a variety of local desserts. 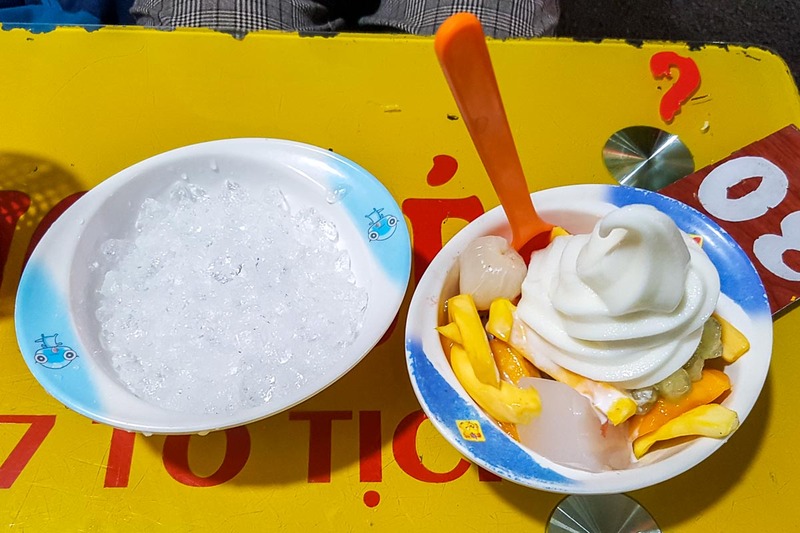 Most people usually order hoa qua kem (35,000₫, ~$2.05), a simple mixed fruit salad served with condensed milk, ice cream, and ice to dilute the sweetness. 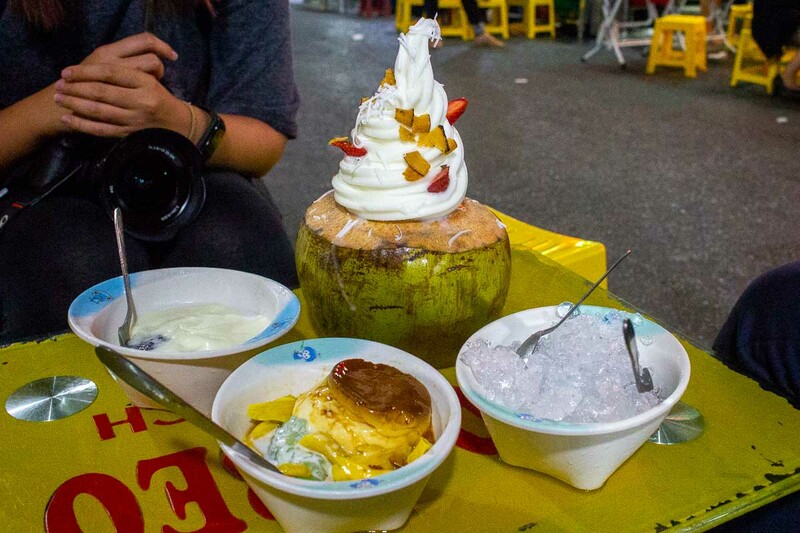 For us, we went with the stall’s more interesting desserts: coconut ice cream (kem trai dua), jackfruit caramel (caramen mit), and sticky rice yogurt (sua chua nep cam). The last one was my favourite — so tart and refreshing! *Pro-tip: Ask for the English menu to see what other desserts they offer. 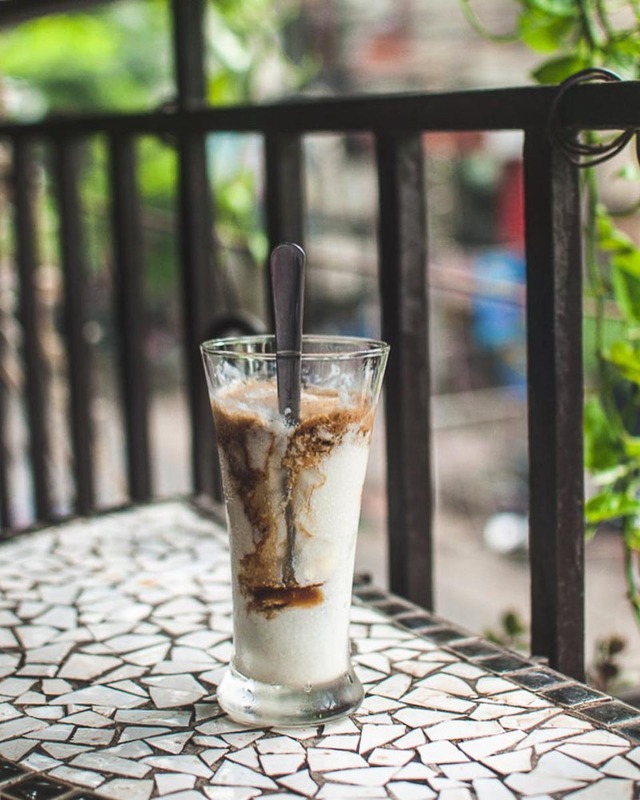 Ask anyone “what to eat in Hanoi?”, and there’s a 95% chance egg coffee (ca phe trung) from The Cafe Giang is on that list. And why wouldn’t it be? 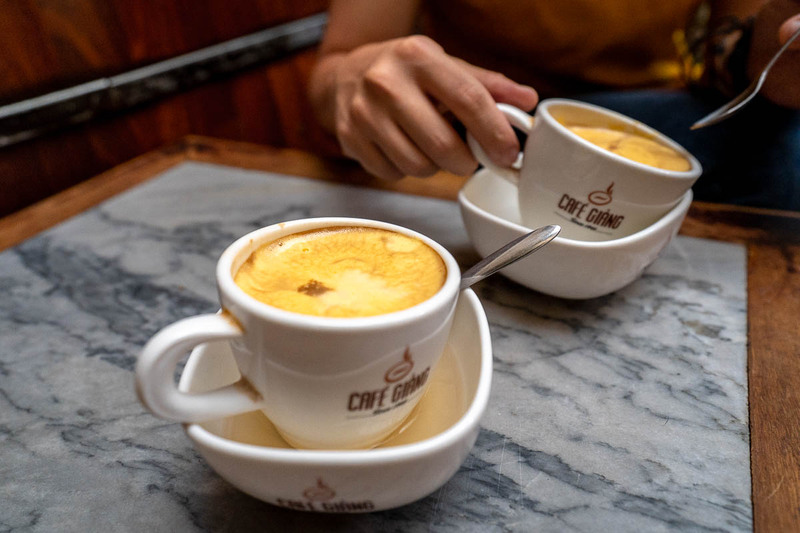 This cafe is the OG birthplace of the iconic drink: freshly-brewed Vietnamese coffee blended with egg yolk, condensed milk, butter and cheese. A cup costs 25,000₫ (~S$1.50), hot or cold. That’s not all! 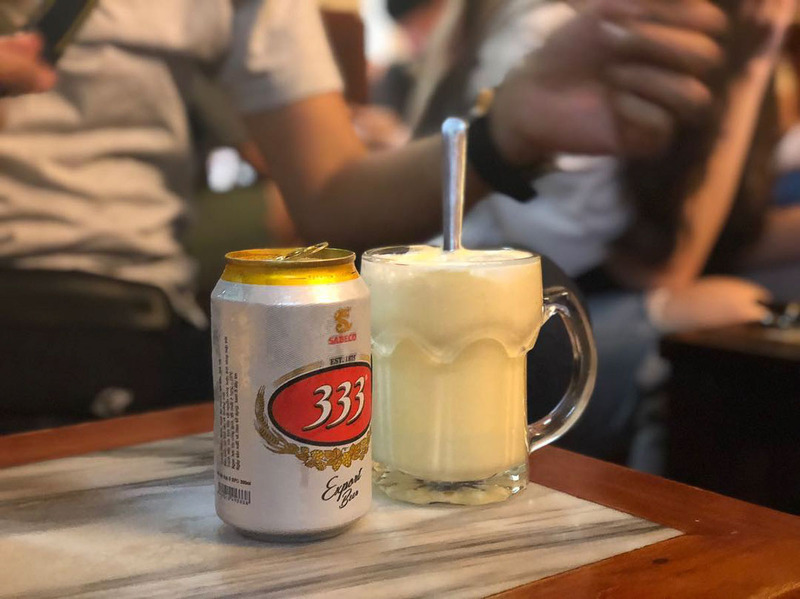 The Cafe Giang also has an arsenal of other egg beverages to try, like egg beer (bia trung) and egg with coke (Coca trung). The egg beer (50,000₫, ~S$2.90) tastes like a delicious root beer float. We’re not so sure about the egg with coke (40,000₫, ~S$2.30), though. Tell us what it’s like if you give it a shot! Cafe Duy Tri is one of Hanoi’s original cafes, operating since 1936. It’s a really small cafe that might be a pain for taller folk, but the drinks are worth suffering for. Their yogurt coffee (sua chua ca phe) is deemed the best in Hanoi. Like liquid velvet, the lovely homemade frozen yogurt complements the robust coffee. Drink up! Wanna find out more about Vietnam? Check out all our Vietnam content here! Have we missed anything on this list? Tell us in the comments below!